For Vinnies volunteers, their time on the soup van is as much about the conversation and company as it is about the food that's shared. It's already dark and the noise of evening traffic fills the street, yet the speaker's soft voice is clear as he looks me straight in the eye. This man has just explained how a motorbike accident which hospitalised him for months, and threats from squatters who took over his home, saw his stable life spiral downwards. The situation left him to resort to crisis housing accommodation. This softly spoken man is one of the many Victorians who have fallen on hard times, are served a meal and are treated with dignity and respect by the volunteers who run St Vincent de Paul's nightly soup vans. On this crisp Monday night, the speaker is a familiar face to twenty-one-year-olds Shaun Bourke and Michael Catania who are leading the Fitzroy Van. This inner-city service was set up in 1975 by a small group who wanted to provide food and friendship to those experiencing homelessness. Vinnies now run seven soup vans across Victoria in Fitzroy, Collingwood, Footscray, Berwick, Rosebud, Endeavour Hills and Moe. They also provide services to boarding houses in the CBD. Bourke and Catania became involved with soup van through their high school and have continued volunteering while studying at university. Since then, Bourke has become president of the Fitzroy Soup Van and Catania is a Monday night leader. From the early days of his volunteering, Catania has relished the chance to build friendships with recipients of the service who are socially isolated and in need of companionship. As president, Bourke oversees the van's leadership and ensures the service runs smoothly and adheres to Vinnies' policies. Taking on the role of president encapsulates his understanding of social justice. For Bourke, seeing the immediate impact of handing out food, serving drinks and providing toiletries and blankets to people sleeping rough makes the challenge worthwhile. 'Knowing you're making a small and tangible difference can be rare in social justice. Sometimes you can fundraise and not know where the money goes', he says. Catania is inspired by the van's accessibility to people of any nationality, culture and religion, which sums up his idea of service to others. 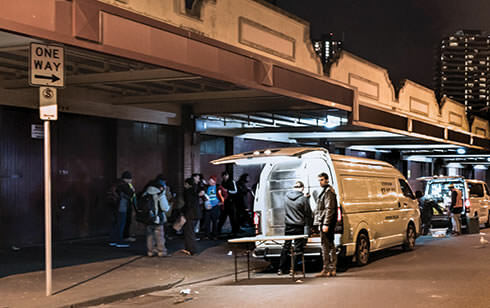 In 2016, the Fitzroy Van provided more than 146,000 meals to people living rough in the CBD, Fitzroy, East Melbourne and South Melbourne, delivering food to over 400 people every night. The demographic the Fitzroy Van serves is varied, a poignant reminder there is no one image of homelessness. On the night I help out, I serve coffee and soup to people who are sleeping rough and can't prepare meals and to others living in community housing who struggle to afford food. Some recipients are families living out of cars, others have become isolated through mental health issues or substance abuse. In the crowd which gathers around the van at each of its five stops there are people who are talkative, laughing and joking with volunteers. Others are more subdued, accepting their pies and sandwiches quietly, but 'what you do is fantastic' is something I hear directed towards the volunteers over and over. The evening's food is carefully prepared from midday onwards at Vinnies' base in North Melbourne. In the afternoon a conveyer belt begins as volunteers of all ages fill sandwiches and wrap rolls, using food from suppliers and donors. The Monday night food preparation and distribution relies predominantly on young volunteers and Catania believes this factor is crucial to maintaining the service. 'I think there's a perception of people who volunteer as being an older demographic. To a certain extent it's true but there's something about what we do on a Monday night, there are young people and it's something different, it's fresh', he says. Bourke and Catania's dedication to this cause isn't limited to a Monday night. Off the van they work hard to spread the message about homelessness and encourage others to volunteer, speaking at youth community events and workshops. During school visits, Bourke tries to break down stereotypes surrounding homelessness and encourage young people to reflect on issues outside their own immediate life. 'My hope is to make them think differently about homelessness. It can affect all kinds of people, we're all only one step away from it', he says. 'Not everyone has the value set to go out and do something about the issue but anyone can think about it and break down that stereotype. Both leaders clearly gain personal satisfaction from volunteering, and that's another reason Catania encourages young people to get involved in social justice. 'Find a cause that suits you and that you're interested in, something you enjoy and are passionate about', he says. 'Homelessness is something that interests me and I've now got this desire to help people who are experiencing it. The International Campaign to Ban Nuclear Weapons (ICAN) was the winner of the 2017 Nobel Peace Prize. Many may not be aware that the campaign began in Australia. We talk to one of the founders, Tilman Ruff, about how the campaign was first launched. Most people know of Australia’s first saint Mary MacKillop, but there are other Australian Catholic women who have also lived prophetic lives. We asked one of our young writers, Tatiana Kurniawan, to share some of their stories. The military in El Salvador might have made Oscar Romero a martyr, but they could never silence him. Young Australian of the Year nominee Olivia Hargroder is talented, determined and a fierce advocate for Australians with Down Syndrome. Today it’s common practice to acknowledge the Traditional Owners of the Land and publicly pay respect to elders past, present, and emerging. But when it comes to managing the environment, do we actually listen to them?